Macular degeneration is a disruption of the center spot of the retina, called the macula. The macula, smaller than a capital A, contains a concentrated layer of light sensitive cells called cones. It is only area in the eye capable of 20/20 vision. It allows us to see faces, read and perform other fine vision tasks. Macular degeneration is the single largest cause of legal blindness in patients over 55 years of age. Juvenile forms of macular degeneration or dystrophies include Stargardt's Disease and Best's Disease. 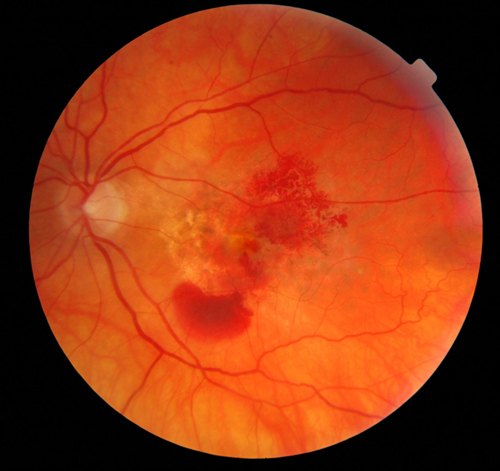 Most patients suffer from age related macular degeneration. Nearly 6% of people between age 65 and 74 may have macular degeneration and between age 75 and 84 about 20% have macular degeneration. There are two types of age related macular degeneration. They are often referred to as wet (neovascular) or dry (atrophic) macular [Wet & Dry Macular Degeneration] degeneration. Wet macular degeneration may result in more severe loss of vision but in progression may be slowed with injections and laser treatments if detected early. Dry degeneration is more common accounting for nearly 90% of age related macular degeneration. There is no proven cure of dry macular degeneration. Nutritional therapies, electro-stimulation, medications, surgeries to relocate the macula and implantation of electronic chips are all under study at this time. None are yet proven but many hold hope for future treatment of this disease. We urge you to discuss treatment options with your doctor to determine if any of these are appropriate. Order our new 60 Minute Video on Macular Degeneration. For more Information, click here. "The Many Visual Problems of Macular Degeneration" Printed in Vision Enhancement Magazine.